Suppose a caveman is eating his first meal. The man finds the meal to be remarkably satisfying, and he wants to replicate it. Meticulously, the caveman replicates the meals, recreating every intricacy of the dish. The caveman notices that his mouth emits a watery substance — what we know as saliva. Advancing in his thought process, the caveman decides to milk his saliva, add it into the meal, and present the meal to his friend, all the while declaring that the meal is the best meal he’s ever had (though it is, in fact, only his first). The second caveman finds the meal disgusting (because, of course, of the saliva). I thought of this while eating my Chinese take out. It’s one day old and cold, and I think I like it that way. Note: I wrote this nearly two years ago, and I didn’t leave any notes for me to expand on. What I think I was trying to ask was, “How far do we go to preserve or add procedures in order to attain a desirable or perfect outcome? I think I was thinking of the scientific procedure (PHEOC, haha). I guess it’s common sense, but it’s like someone studying the life cycle of different cells. We record and control the temperature and agar that the cells find themselves in, but what if handling them a certain way induced something that we would have never observed? It’s a stretch, even by scientific standards (even if that standard does allow for this extreme scrutiny), but it’s something I always think about when I’m learning science. What if Ernest Rutherford’s gold plates had caught themselves on his wool sleeve, and what if that had induced a certain characteristic that allowed for the deduction of his atomic theory? It’s clearly a stretch, and is probably a negligible detail, but I am fascinated by the possibility. Who’d have thought Chinese food would lead me to think of science? I played World of Warcraft for a month last summer. My friend, Jimi, wanted to try the free 10 day trial, but I refused. I thought World of Warcraft was beneath me. He kept badgering me, and, eventually, a small part of the wall I put up between me and WoW scratched off. We played the trial for 10 days together, and, when we exhausted those 10 days, we went to Best Buy to purchase our first month of subscription (which is technically only purchasing the game, and the first month is free, so technically I’ve never payed to play the game since I never renewed my subscription). He bought the expansion pack, while I settled for the base game. This summer I’m feeling that buzz again. I probably won’t buy another month, but I want to so bad! Why?! What makes WoW so fun? I think its the quests and the relationship you build with your character. That sounds incredibly geeky, but we all develop close relationships with nonhuman and nonliving things; I’d say I have a pretty close relationship with my camera and cello. When you develop an intimacy with a human analog, though, that relationship becomes even more intimate. My female Undead mage is around level 35 when I last played, and although she will cap at level 85, I see her as limitless, as someone who can make and be a difference in Azeroth. In addition to the character, people spend so much time in WoW because we want life to be like that. We want defined goals that we will spend our entire life chasing, and we want to believe that we are and can make a difference. Even when we hit our “cap”, we will still want to look for things to be accomplished. We want to continually make ourselves better and to discover new ways to make ourselves better. Then when we do get better, people want to be like us and so they look for ways to get better. Imagine if gamers could see the world as they do WoW; that’s an untapped potential in a demographic so looked down upon. If we can see and enjoy life as we do WoW, we’d be unstoppable. If we could do that, Azeroth and Earth might be a very different place. Note: Since writing this, I have exhausted my 10 day trial for the WoW expansion pack, Burning Crusade. Surprisingly, I didn’t spend the entire 10 days logged into Azeroth, but I spent more time than I normally would with any digital game. Sometimes I wish I had played WoW during high school or some other time when I had less care and responsibility. Also, I think it’s a shame that our society looks down on gamers. We muzzle our disbelief behind muffled laughs when we hear about someone who expresses themselves more openly over the internet. I do not discredit the notion that this is unhealthy, but I don’t think it’s something we should shame. I think that form of expression is something that we shouldn’t necessarily inhibit, but cultivate and redirect. If the people who do find shelter behind a computer screen could unleash their creativity and passion that they pour into the internet into the real world — gah! That would be overwhelmingly beautiful and incandescent. The world would never be the same! Gamers ftw. 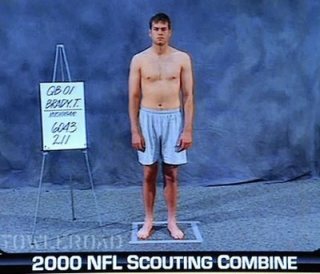 Tom Brady was drafted in the 6th round of the 2000 NFL draft. If you don’t understand the draft or football, you only need to know these two things: 1) Tom Brady is arguably the best quarterback in the NFL ((I actually think Peyton Manning is the best, but the two are nearly interchangeable for the title.)) 2) There are 7 rounds to the NFL draft, 32 slots in each round, and finding a talent — a legendary talent, nonetheless — in the 6th round is a steal (a very good selection considering the slot the player was drafted, and the player’s talent) and VERY hard. Like many drafts, the NFL draft can be a crapshoot, but the Patriots did right in 2000. Peter King, a writer for Sports Illustrated, published in his Monday Morning Quarterback column that Tom Brady had only one gripe about his career thus far: he was drafted in the 6th round. ((I wish I could find the column, but it escapes me.)) If you still don’t understand football or the draft, you only need to know this: being drafted in the 6th round means that 32 teams passed on choosing you to play for their team at least 5 times. According to Peter King’s expose, this was Tom Brady’s only gripe. Hearing Mr. Brady say that this was his only gripe had to mean something, and, of course, it does. One of the greatest quarterbacks to have ever played the game was drafted in the 6th round. In more accessible, albeit trite, terms, Tom Brady overcame the odds. He is inspiring. What does this mean for me and you? Sure, Tom Brady, an athlete with exceptional gifts and talents, overcame the odds and made a career for himself in the NFL, but what about us? We aren’t Tom Brady, but that hardly means we can’t do as he did. This is an extreme example, but if you’re set up 90 metres behind in the 100 metre dash, will you give up? If you give up, you lose. If you still race as if you were in parity with the other racers, you will probably still lose, but you’ll have exhibited an exceptional spirit and attitude. That spirit and attitude is inspirational; it is vital in overcoming any odd. That spirit and attitude is habitual of the excellent, and practiced by the world changers. That spirit is Spirit, and that attitude is Attitude. Tom Brady has that spirit and attitude. Do you? Note: Peyton Manning, Tom Brady’s “nemesis”, was drafted in the 1st round, the second slot. I like Peyton better than Tom, but I should also mention that I like Peyton’s brother, Eli, even more than Peyton. The top image is a capture of Tom during the scouting combine when NFL scouts run the draft prospects through drills to get a better feel for their attributes; the photo is almost humiliating, almost like a shame on top of the shame of being drafted in the 6th. The bottom image is a capture of Tom overcoming his draft slot, and winning, as of writing, 1 of his 3 Superbowls wins.